At the first sign of a cough, many people turn on the humidifier to add moisture to the air. Humidifiers come in several different sizes: Central units are designed to humidify the air in an entire house; console units are encased in a cabinet that sits on the floor; portable units are small enough to be carried from room to room. Some humidifiers disperse cool mist, and others disperse steam. Opinions vary on whether humidifiers ease cough and cold symptoms. If you use a humidifier, take precautions to avoid potential problems related to bacteria, fungi and dust. Although people have used cool mist and steam humidifiers for decades to treat cough and cold symptoms, there is conflicting information about their effectiveness. 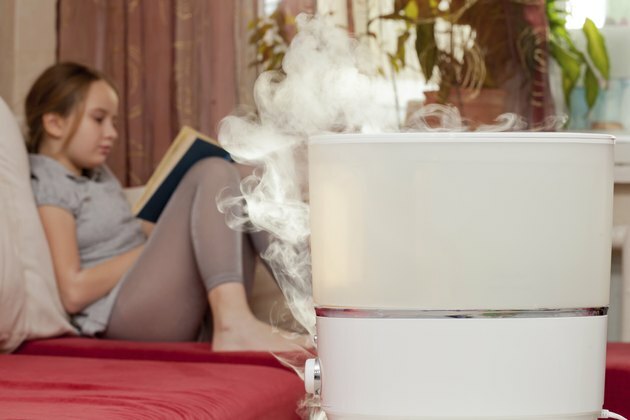 For example, the Centers for Disease Control and Prevention suggests that a cool mist humidifier can soothe a cough by loosening mucus, but reviews by the World Health Organization and the Cochrane Collaboration conclude that there is not enough evidence to support either cool mist or steam therapy. If a humidifier -- especially the cool mist type -- is not cleaned properly, bacteria or fungi can grow in the water tank and release into the room through the mist, potentially causing health problems ranging from flu-like symptoms to serious infection. A portable humidifier tank should be emptied, wiped dry and refilled daily. Every third day, all parts of the unit exposed to water should be scrubbed with a disinfectant to remove film or other deposits, and then the tank should be rinsed thoroughly before the next use. For central or console units, follow the manufacturer's instructions. When you're done, be sure the humidifier is clean and dry before storing. Use distilled or demineralized water instead of tap water in a dehumidifier to prevent mineral deposits from forming in the water tank or other parts in contact with the water. Using distilled water also reduces the potential for microorganisms and minerals to be dispersed into the room. The health risks associated mineral dispersion are unclear, but the February 2011 issue of "Pediatrics" included a single report of an infant who experienced lung injury after inhaling mineral dust emitted by a humidifier. When indoor humidity levels exceed 50 percent, the moisture in the air can encourage the growth of mold and bacteria. It can even condense on windows, walls and pictures. So if you notice condensation, the air in the room is likely too humid. Some humidifiers have a built-in control you can set to a desired humidity level, or you can use an inexpensive hygrometer to monitor humidity levels in your home. Steam humidifiers are a major cause of burns, particularly in children. Burns can occur when someone gets too close to the steam or if the boiling water spills from the tank. Cool mist humidifiers are the best option for a child's bedroom, and steam humidifiers should not be used anywhere within a child's reach. Also, be sure that the plan to humidify is a good one, because not all coughs are caused by colds. For instance, humidification might be inappropriate for a person with an asthma cough who is sensitive to humidity-loving allergen sources. Any troublesome cough that persists for more than three weeks should be evaluated by a doctor.